El Pinto Restaurant in Albuquerque New Mexico is now using 100% pasture-raised eggs for all entrees. El Pinto Restaurant is one of the few, and the definitely the largest, restaurant in America with a pasture-raised egg commitment. 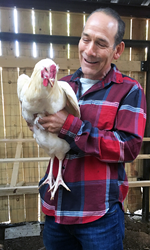 Jim Thomas, owner of El Pinto Restaurant, with one of the new chickens living on 10,000 square feet of pasture on the property. Healthy happy hens produce eggs of amazing nutritional value and outstanding taste.